Making stops in Brisbane, Sydney, Melbourne, Adelaide and Perth, the comprehensive run will see the wildly popular quartet reconnect with a fanbase hungry for new material nearly four years after the release of their previous ARIA #1 album Wilder Mind. 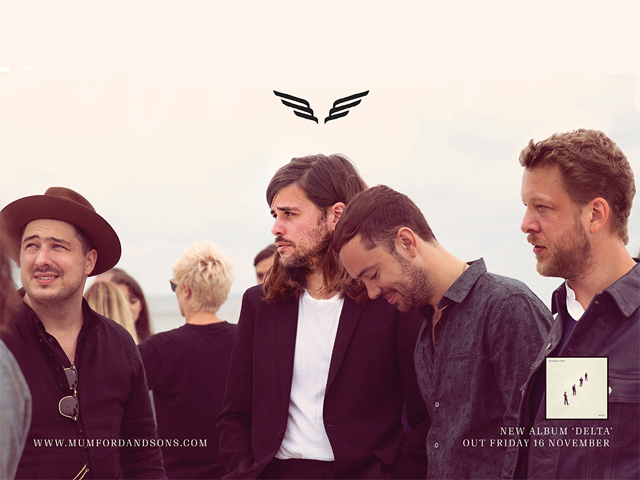 With new single 'Guiding Light' released last month, Mumford & Sons have once again proven, they are in the form of their lives. Speaking about the new album, lead singer Marcus Mumford has said that Delta represents a place where "order meets chaos and shelter meets wilderness". In this observation, he could easily be referring to the bands' infamous knack for sweeping, organised musical tumult. Transition has been a theme for Mumford & Sons since they first burst into our lives almost nine years ago with their iconic debut single Little Lion Man. With that Hottest 100 topping release they ushered in a new era of melodically stunning heart-on-sleeve folk that was recognised the world over. Masters of the call-to-arms, the band then went on a wildly successful run as their albums Sigh No More, Babel and Wilder Mind sold into the millions. They were awarded the Album of the Year Grammy in 2013 (for Babel) and their songs 'I Will Wait', 'The Cave' and 'Roll Away Your Stone' have entered the public lexicon as rousing anthems to be sung in full-throated unison. Always a huge hit on this side of the planet, Mumford & Sons were last in the country in 2015, where they closed out their wildly successful Wilder Mind Tour in Sydney with their special Gentlemen of the Road one-day festival. In a coup for Antipodean fans, the upcoming tour will see the band return to our shores in one of their first major international runs after Delta's release on November 16 this year. Michael Kiwanuka signaled his arrival as one of the UK's most distinctive new voices in 2012 with his vintage soul imbued debut album, Home Again. It was a voice that sounded both rich and timeless, and the young Londoner received widespread critical acclaim. 2016's Love & Hate LP was a different beast entirely, produced by Danger Mouse it was one of the year's great peerless records and picked up support across the globe, earning Michael his first number 1 album in the UK, and his first Brit Award nominations too. Having toured the globe alongside a very special collection of musicians, Michael Kiwanuka is a true artist of distinction, and with the best almost certainly yet to come.